This summer’s blockbuster, playing in every home, is the return of a bull market in REEs (“Rare Earth Elements“) caused by the Trump Administration applying tariffs on goods from China. I am calling it “Senkaku 2” as the next embargo on REEs is, again, just a seemingly trivial incident away. 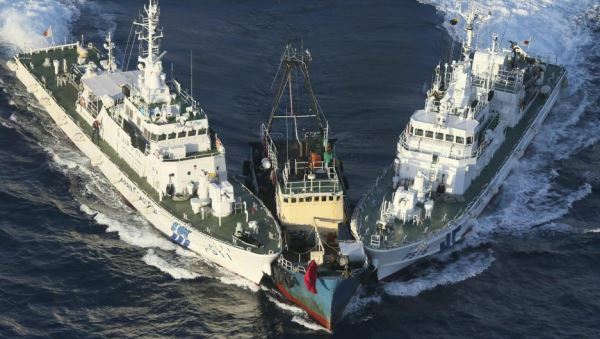 You may remember that Japan‘s coast guard arrested an errant Chinese fishing boat captain in September 2010, with the result of a total embargo on REE shipments to Japan causing REE prices to go up as much as 3,000% almost overnight. Consider the economic impact of Japan arresting one Chinese national, and compare that to the billions of dollars, and trillions of yuan, in economic impact of the new tariffs, and then ask yourself: What is China likely to do now? One possibility is another total embargo of all key resources from China. Whatever the incident will be this time, if any at all, China is about to strike back with a retaliatory response that may very well involve REEs and other commodities deemed critical for the economic and national security of the United States. In a trade war with China, there will not only be losers but also winners – and it is not hard to see who they will be, although global media just seems to focus on the losers right now. One of the winners is certainly going to be the mineral exploration industry outside of China, as the United States – and perhaps the Western World – will be forced to realign commodity distribution routes. While the stage is set, the time to act has come, for nations and investors alike. The escalating trade war between China and the US puts the spotlight on a number of commodities in Zimtu Capital‘s portfolio – REEs, tantalum, niobium, magnesium, fluorspar, and lithium – and certainly presents an opportunity for growth in the exploration and mining sector. This trade war is going to focus attention on the exploration industry to discover and develop new sources of supply in friendly jurisdictions. This will be particularly effective for the REE and battery metals sector, which are heavily dominated by China. I am not alone with my contention that it is Trump’s full intention to engage in an all-out trade war with China. It should come as no surprise that China is seen by the US as an unreliable supplier of resources, and that market manipulation is endemic with the Chinese. I strongly believe that the latest tariffs are the catalyst that will direct focus on other, more attractive sources for these commodities, such as Canada. Recently on July 10, the Trump Administration quietly released the 3rd round of trade tariffs in a document that runs to 200 pages, with ~40 line items per page, including all kinds of raw materials, commodities and finished products. Most interestingly for Commerce Resources Corp., “permanent magnets and articles intended to become permanent magnets“ as well as all kinds of “rare-earth metals, whether or not intermixed or alloyed“, “mixtures of rare-earth oxides or of rare-earth chlorides“ and “compounds, inorganic or organic, of rare-earths“ are found on this list. Also, tariffs on niobium and tantalum are applied, making Commerce Resources, as well as its joint venture partner Saville Resources Inc., all the more attractive to look at for investors (see report “Saville Releases High-Grade Assays from the Niobium Claim Group“). As China runs out of tariff bullets to fire, it must turn to embargoes and boycotts. China has repeatedly used boycotts and embargoes as cards in its geopolitical strategy. We may just haven’t noticed it. A Chinese embargo of REE to Japan (the Senkaku Incident) caused the REE crisis of 2010-1012. A Chinese embargo of Japanese cars in 2012 caused Japanese car exports to plunge in the 12 months that followed. A Chinese embargo on numerous South Korean exports in 2017 led to complete, unequivocal victory for China. A recent Financial Times poll shows that the China state media ‘boycott’ war drum has already started beating, as above poll table shows. If threats of a boycott don’t make Trump blink – and they won’t – then China will launch its embargo torpedoes; not all at once, but one after the other. Each one of them will be massively impactful. REE may well be the first. A key point is that the embargoes may not only be against the USA, but against it’s allies. The Senkaku Incident targeted Japan, not the USA, but we all know the effect. China remembers that. One does not have to officially embargo to actually embargo. One can simply have ”not enough to share with everyone else”. China has been warming up the reduced REE supply story for almost a year already. One REE operation after the other has been taken offline in the name of environmental concerns or so-called illegal mining practices. In early July, operations at the Guangxi Rare Earth Mine in southern China were suspended after inspectors found the breaching of environmental rules. On top of that, inspectors in another of China‘s rare earth hubs, Baotou in Inner Mongolia, had found that mining slag was being dumped illegally. China’s Ministry of Ecology and Environment is implementing new measures to crack down on the pollution of rare earth mines, obviously not being shy to shut down mines and to eventually trigger higher prices due to supply constraints. And then there is Chinese de facto control of resources outside of China, in most of Africa for instance. Currently, Chinese President Xi Jinping visits 5 Arab and African countries. Yesterday, he met with Rwandan counterpart, Paul Kagame, to further promote bilateral cooperation. Why? Mining is Rwanada‘s biggest source of export revenues, first and foremost tantalum, tin and tungsten. Major Bull Market in REEs Ahead? In order to promote the establishment of the REE mining and downstream sector in North America, a major repricing of REEs would be helpful as prices have been artificially suppressed by China for decades. REE production in China has been incentivized by subsidizing its mining and manufacturing sectors. In other words: Those investors brave enough to position themselves before the storm of the masses hits the markets may bank the lion‘s share of profits to be made. Commerce Resources, among others in the Zimtu portfolio, could very well evolve as a winner. If indeed REE prices are set for a strong rebound, investors’ interest should return to the REE exploration sector, quickly realizing that there aren’t many promising REE development projects and that Commerce Resources‘ Ashram REE Deposit is seen as best in class to supply those key REEs that the market needs. Today, Commerce announced the first ever production of a mixed rare earth oxide concentrate from material of the Ashram REE Deposit in Québec. This independent success was achieved by Québec City‘s Universitè Laval, a public research university founded in 1663 and thus the oldest centre of higher education in Canada. The test work, which includes pilot level components, is fully funded through a grant provided by Quebéc‘s Ministère de l’Économie, de la Science et de l’Innovation, whose mandate is to “advise the Government with a view to favouring economic development in every region of Québec“. As we like to say “it’s the early bird that gets the worm, but it‘s the 2nd mouse that gets the cheese” meaning, as huge profits are being made by some investors in the battery metals space, all investors should be looking for that next big win, which is arguably going to be the REEs. The overall number of REE juniors, still active on their projects, is a fraction of what it was in the heyday of 2011, whereas the market looks much more robust and poised for a healthy long-term upward trend in prices and demand for the future. The opportunity has clearly arrived and has never looked as promising and sustainable as today. While everyone has focused on lithium and cobalt for the “Electric Revolution“, it’s clearly the REEs which have been overlooked and, if tariffs on REEs from China are imposed, will potentially now provide profits to those invested in this sector. While there are hundreds of juniors and seniors actively pushing into the once-niche metal markets of lithium and cobalt, there are barely a handful of REE companies at which investors could possibly look for a meaningful exposure. Of greatest importance, over the same time period (late 2010 until now) the demand for REEs has steadily increased mostly due to the ascendancy of the “green revolution“ focusing on renewable sources of energy, primarily wind (which require REEs), and for the adoption of electric vehicles (which require REEs). This increase of demand came at the same time as the prices continued to revert – and while all REE juniors attempted to achieve positive metallurgy. In this regard, only a very few were successful, first and foremost Commerce Resources with the advancement of its Ashram REE Project towards Pre-Feasibility Study. Soon, the market may realize that Commerce Resources‘ advanced-stage Ashram REE Deposit is “the place to be“ as it can compare favorably in one respect to the Chinese REE mines for the simplest of reasons: The fact that the Ashram Project has the same geology and basic mineralogy as have the dominant Chinese REE projects. The capability of producing a saleable mixed rare earth oxide concentrate – with a simple flowsheet – is one of the more important aspects to look at when searching for the next REE mine to be developed. Likewise, other companies in the Zimtu portfolio, such as Saville Resources advancing a potentially high-grade niobium and tantalum project as a joint venture partner with Commerce Resources, should not be overlooked and could offer tremendous upside. Zimtu is increasingly turning out as a “one-stop shop“ for key commodities in friendly jurisdictions. Incidentally, you don‘t want to miss that boat.